Deep relationships are the basis for our work in La Limonada, and we want those relationships to include you as well. A great way to lay the groundwork for such relationships is by going to Guatemala to meet the people of the community and the team that serves there. While your group may focus on a specific project during your time in La Limonada, we encourage you to go to the community first and foremost as learners. We believe that more is learned from the people who live and serve in La Limonada than from what a group could teach in the short-term. Therefore, we are careful to approach our Service Learning Trips from a perspective of “learning from and participating with” the people of the community. As we schedule your itinerary we will work to maximize opportunities for your group to interact with the people in the community, listening to their stories and learning from their lives. We ensure that all projects are undertaken alongside our Guatemala team and the people of the community. In that context we believe there will be multiple opportunities for shared learning and building meaningful long-term relationships. It will be our privilege to serve you and your group in this way. The process begins by completing a Group Application. 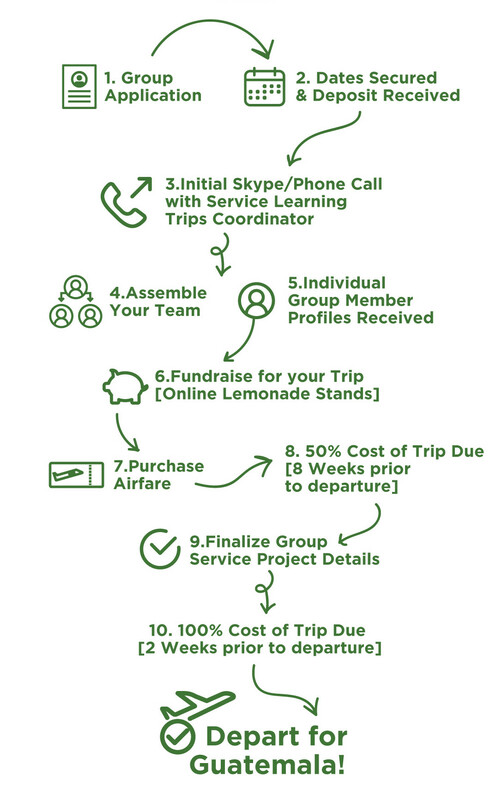 Read through our Service Learning Trip FAQs and review the 10 steps infographic below. If you have any questions throughout this process please contact Silvia Lopez, our Service Learning Trips Coordinator. Check the calendar below for available dates for your group and provide dates you are interested in on your Group Application.